Pomegranate molasses is made up of the fruit’s freshly squeezed juice, then simmered until it is reduced to a thick syrup. The process is tedious, it involves peeling off the outer layer of the skin and then removing all the membranes from the various segments of the fruit, otherwise this will add bitterness to the juice. The fruit pieces are then juiced and poured into a large pot and left to simmer for many long hours. My mum and dad collect the fruit each year from their tree and produce their own molasses. We are so blessed to have such gorgeous, organic and pure molasses. It is widely used in Lebanon especially as a salad dressing for fattoush, a salad renowned for the crisp flat bread that is added to it just before it is served and to drizzle over meat filled pastries, lahm b’ajin . I use it as a dressing in salads or over boiled beetroot with just a squeeze of lemon, absolutely delicious. I also like it as side condiment to steaks, lamb skewers and kafta. It is a much healthier alternative to some other sauces. With no added sugar or preservatives, not to mention how full of antioxidants pomegranates are, they turn this dish to an absolutely delicious and very healthy meal. 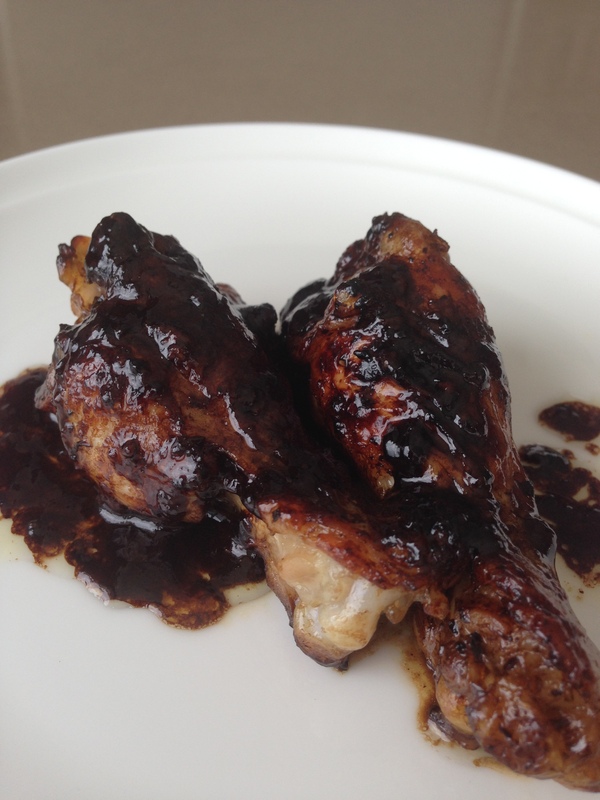 Its sweet yet sour flavour does wonders to the chicken wings in the recipe below. 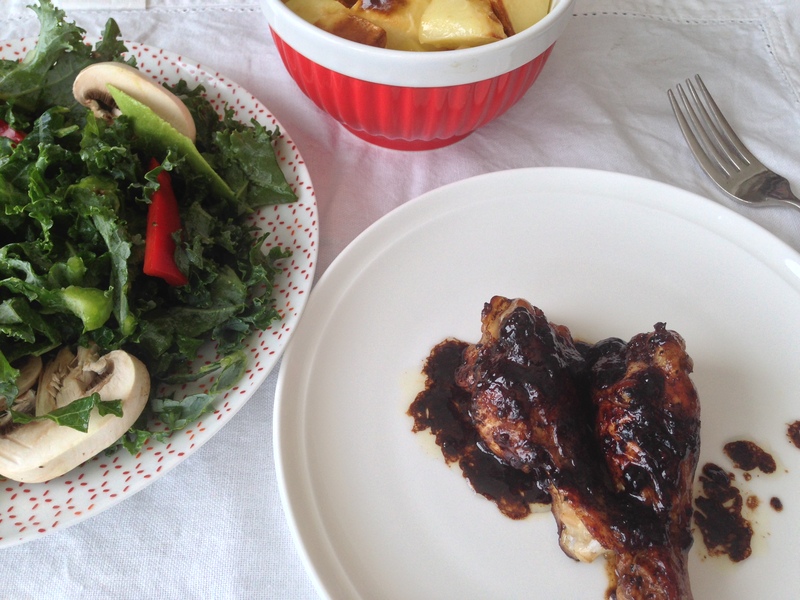 This is my mum’s recipe and it is so easy to prepare and always a great hit at dinner parties. Try it, you will love it. Salt and black pepper to taste, I would use about 2 teaspoons of salt and 1/2 tea-spoon of black pepper. Clean chicken wings and cut into three, discarding the end piece of the wing. I prefer not to use it as it is full of fat. Remove excess skin of wings. Salt and pepper wings to taste then place under the grill on medium heat in the oven. Toss after about 15 minutes and when chicken is golden colour, crush garlic and mix with lemon juice and pomegranate molasses and poor all over the chicken, coating very well. Return to oven and cook until sauce is thick. Toss once or twice at this stage. I like to serve it with baked potatoes which I had peeled and cut into pieces. 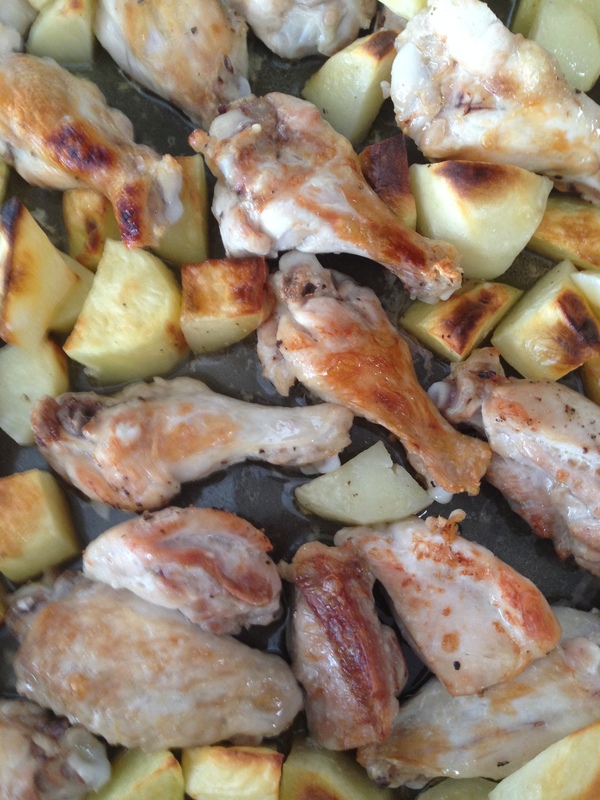 You can cook potatoes with the wings in the same tray but remove before adding the molasses , garlic and lemon juice mixture. Refer to photo above. Tags: chicken, chicken wings, drumettes, food, healthy, Lebanese, Mediterranean dishes, molasses, Pomegranate, potatoes. Bookmark the permalink.